Always organic. Nothing unnecessary. Setting standards. No junk promise. Contains naturally occurring sugars. 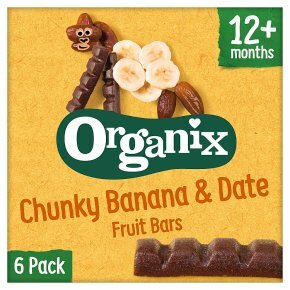 Suitable for vegetarians.For little explorers on the go... our delicious banana & date chunky fruit bars are 100% fruit squished into bite-sized pieces. SAFETY ADVICE: Not suitable for children under 12 months. When feeding a child, please ensure that they are sitting down and are supervised to reduce the risk of choking. Every care has been taken but date stone fragments may remain. IMPORTANT INFORMATION: This food has no added colouring but the natural ingredients may cause staining.